Tarragona, October 27, 2016. 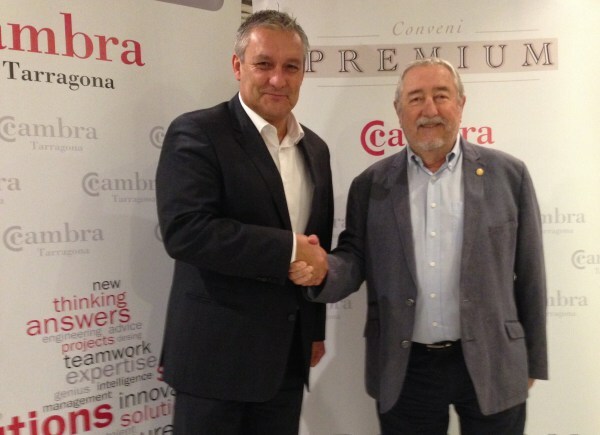 - Andreu Suriol, president of the Cambra de Tarragona and Marc Fargas, director of the Ercros’ Industrial Complex of Tarragona, presented the Premium agreement of the Cambra de Tarragona. Through this agreement Ercros supports the initiatives on economic revitalization, structuring of the territory and promoting the internationalization of companies that are driven by the corporation in Tarragona. With the Premium conventions, the Cambra de Tarragona is creating a number of synergies with the leading companies in the Tarragona region, or those with interests in the territory, and thus achieving the necessary force to continue making the Cambra de Tarragona a proactive concerning civil society in boosting the economy and helping entrepreneurship.